Maturing the K1 Media bio-media is important because a delicate eco-system is naturally developing for the bacteria involved in the nitrification process. K1 Media provides the maximum active surface area for the bacteria to colonise, more than other types of static media. It is this process which removes harmful ammonia and nitrite from the water. As the K1 Media moves within the filter, it causes the old dead bacteria on the outside to be displaced. This makes space for new younger heavier feeding bacteria to rapidly colonise. Within the wheel is a protected surface which enables colonies of bacteria to naturally follow their life cycle, of maturing, dying and then fueling the latter stages of the nitrification cycle. 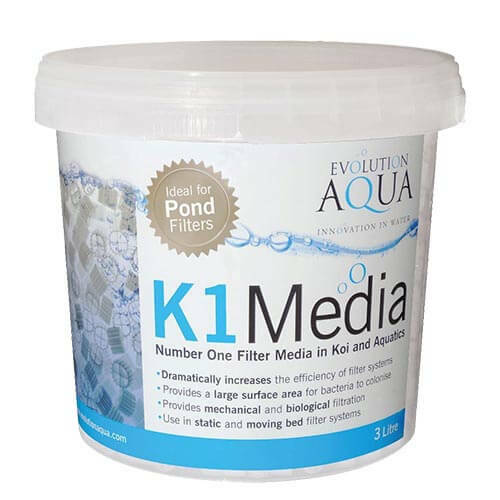 K1 Media has been designed to provide the best possible habitat for both young and mature beneficial bacterial colonies.